This is an advertisement for Bunnett and Co., engineers. It has often been said that the British engineering industry suffered a decline after 1850 but it must be pointed out that it was a relative decline and output continued to grow in all fields. No other nation at this time could rival Britain’s technological expertise. 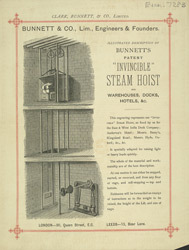 In the 1800s there was an exceptionally stimulating atmosphere for those interested in science, engineering and invention, and hundreds of patents were taken out for machines similar to the steam hoist featured on this leaflet.